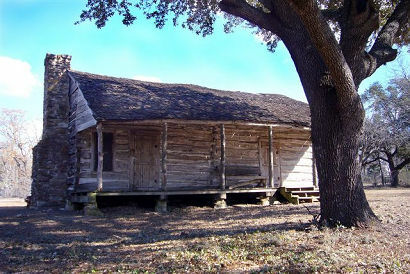 The Historic Brock Cabin in Lockhart, Texas. 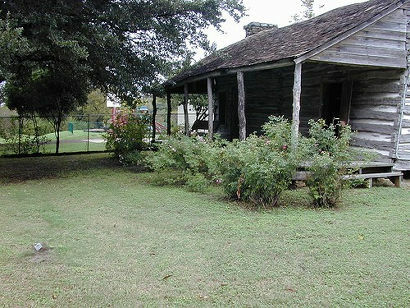 Thanks to the efforts of the Save the Brock Cabin Committee, the �Brock Cabin� remains standing in Lion's Park just off Highway 183 in the center of Lockhart, Texas. The historic cabin was moved to the park several years ago in an effort to preserve an important part of the town's heritage, but it was in danger of being torn down until the committee's efforts saved it. Members of the committee have hopes of one day creating a historical park on the site that will preserve even more of Lockhart's past. Andrew Lee Brock was born in Tennessee on February 5, 1830, and moved with his family to Missouri where his father served as a district judge. In 1848, Andrew set out for Texas where he became one of the first settlers in Caldwell County. At that time the County was on the fringe of the Texas frontier, and Lockhart was very much a frontier town with a courthouse square made up of mostly saloons. Gunfights and shootings were commonplace. Young Andrew soon made the acquaintance of a pretty widow, Rebecca Montgomery Wayland. The Montgomery family had also immigrated to Texas from Missouri where Rebecca�s father, �Black Bill� Montgomery distinguished himself as a Colonel in the Black Hawk War. Sixteen year-old Rebecca married William Wayland before her family joined the mule train bound for Texas, but William took ill and died on the trail near Dallas leaving Rebecca alone to raise their daughter, Willie Annie. Andrew and Rebecca were married on December 18, 1850. They were very popular in the community and their wedding was a reason for great celebration. As a wedding present, Rebecca's father gave the young couple two hundred acres of land located about two miles from present day Lockhart near Boggy Creek. In later years, Brock would remark that he, "started farming with a wagon and a team." Constructed of hand-hewn logs, "The Brock Cabin" was built during the couple's first year of marriage, with Andrew doing most of the work by himself. The small, soundly built cabin has two rooms across the front, a loft, and a long shed room that spans the entire length of the back. A galley porch graces the front of the structure and an unattached kitchen once stood just outside the back door. Andrew labored long and hard to build a suitable home for his young family, and he was fond of saying," Rebecca would make me a green apple pie when I did a good day's work." At first, Andrew was more of a farmer than a rancher, his primary crop being cotton, with a little corn, wheat, and oats on the side. The enterprising young farmer also built and operated his own mule-powered cotton gin and a mill for grinding meal and flour. Hauling cotton to Laredo for the Confederacy proved to be a profitable business during the Civil War, and Brock supplemented this income by returning from the border with goods to sell that were in short supply in wartime Lockhart like coffee, salt, sugar, and calico. Anticipating the end of the open range in Texas, Brock also applied for and received a patent for a wire stretcher. Eight of the nine Brock children were born in the little log cabin before the year 1874, when Andrew purchased a three room house furnished with imported French furniture and moved the family to Lockhart. Andrew continued to add to the newly purchased home with lumber shipped in from Port Lavaca until it was a rambling structure consisting of seven rooms downstairs and three halls and two rooms upstairs with dormer windows. The Brocks were proud owners of the first indoor tub in the county. Made of zinc, it included a shower that was operated by elevating two buckets of water over the tub. Rebecca Brock was also one of the first women in the county to have a sewing machine. While Mrs. Brock was busy making a home and caring for the family, her husband was raising and selling mules in Missouri. Andrew Brock also bred horses that he raced in New Orleans, St Louis, and New York. Unfortunately he lost large amounts of money on this venture, but resourceful as always, he began to recoup his losses by financing the construction of buildings and renting them to businesses in Lockhart. By 1900, Brock owned twelve buildings, six of which were placed on the National Register of Historic Places in 1978. The buildings, located on the historic square in Lockhart, are still in use today. Six of the Brock children lived to adulthood, and having been given between one hundred and two hundred acres of farmland as a wedding present, each of them became residents and contributing members of the community. In 1897, at the age of sixty-seven, Andrew Brock, continuing to remain busy in his later years, applied for a patent on useful improvements to disc cultivators and was granted the patent on August 9, 1898. Rebecca Brock died on November 10, 1900, and Andrew Brock died on January 15, 1903. During their lives, Andrew and Rebecca were an instrumental part in the transition of Lockhart and Caldwell County from an unsettled patch of wilderness into a growing and thriving community. The �Brock Cabin� stands today as visible testimony to their efforts and sacrifices. The Brocks are buried in the Lockhart cemetery.